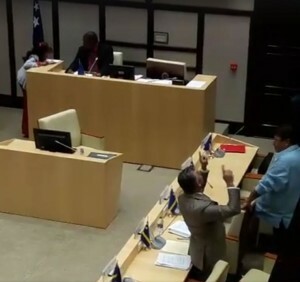 WILLEMSTAD – The Interim President of Parliament Humphrey Davelaar is guilty of document forgery if the seven new Members of Parliament are sworn in. This is according to the opposition leader Gerrit Schotte. Schotte said yesterday in a televised interview that there was no majority in Parliament to approve the credentials of the seven new MPs. The former Prime Minister declared further that Davelaar can never prove in writing that there was a majority. “This is why he is guilty of forgery!” said Schotte. Schotte did not comment about what the opposition’s next step will be.